Luger von Wolfgang Seeley here, reporting live from Pittsburgh South. I've only been "live" for 96 days and counting. Thirty-two of those days have been spent in my first efficiency apartment. Let me simplify this for you, since numbers are very confusing, especially with all those dog year conversions. I was born on Christmas Day, 2016, in Edinburg, Virginia. I moved to the Pittsburgh, Pennsylvania area on February 27th to be with my adopted family. I now live in a gated community in a large, one room, rent free apartment. I think there are more rooms, but those gates are blocking access. Security is tough here, but maid service is great. My parents call this room a kitchen, but it is also my bedroom/play room. It has an ice cold storage closet with a door that's constantly opening. I often look inside to get brief glimpses of culinary delights. That's where they keep my string cheese treats (bribes) and frozen Kong toys that soothe my teething gums. If only I can learn to open that door myself. I get to play many games in my new apartment such as: fetch the tennis ball, guess the chew toy (What is this word "No" you speak of? Must not be a chew toy! 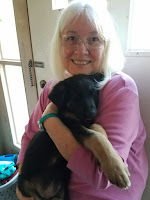 ), kiss the cook, she seems to prefer licks rather than puppy bites, kill the squeak toy, make Mommy and Daddy laugh with my antics and explore new frontiers. One of my friends on Facebook was telling me about apartments with "rain rooms!" I think I have one of those. Mommy opened the gate one time, and showed me a room with strange gadgets. She pointed out a people potty, but said I had to go potty outside. She called me a good boy for always using the correct potty. She let me play in an enclosed area, and said I would soon be getting showers in here. Was she talking about rain showers? Very strange! I've already graduated from puppy school. I'm going to miss seeing my new friends, Blaze, Sassy, Jesse James, to name just a few. I'm not going to miss Ace. He's a big bully, and he always tried to eat me! Teacher had to keep giving him time outs. I'm taking classes now with a police officer who trains guys like me to be cops. When I grow up, I just want to be a good citizen and be able to protect my family. I'm learning lots of new commands like: sit, down, heel, come, stay, leave it, etc. The course is challenging, and I come home exhausted, but in a good way. I'm the smallest and youngest in class, but it's fun playing with the big guys. Officer Mike keeps telling me how smart I am. He's pretty smart, too, and definitely the alpha male of our pack. Well, it's nap time for me. Please direct all comments to my Mom at the link below. She's going to make me her new assistant, but said I could keep writing my own blog. She also said favorable comments are her treats! How strange! Sandra Warholic Seeley is the creator and author of Kanela's Korner and The Sandra Seeley Column. She is a lifelong educator who has taught in Hawaii, where Kanela was born; Bethel Park, where her 3 children were born and in the inner city schools of Pittsburgh Public where her passion for the underprivileged began. Kanela's Korner is often 95% fiction and 5% fact, leaving the reader to do the math. Her motto is: Funny or not, here I come! To contact the author, click the following link. Luger,I'm so proud of your newly acquired writing skills.Keep up the good work.